Have any of you been feeling some rather intense energy over the last few days …particularly around family, security, home, mothering, roots? Well… its not really surprising, as we prepare for the New Moon Solar Eclipse in Cancer in the early hours of Friday morning 13 July (in South Africa). It’s always emotionally intense when both the sun and the moon are in the watery, sensitive sign of the crab, but this one takes it up a good few notches. When we have a solar eclipse, the sun is overwhelmed by the moon. In other words the feminine vanquishes the masculine. The light disappears and we are pulled into the darkness for a while. This can feel scary at first, but when we stay there for a while, our eyes start to readjust and we start to see things differently. When the obvious colours and details are not available, we start to look at things in a deeper way. That is what is asked of us now. This New Moon eclipse forms an exact opposition to Pluto, the king of the underworld, modern ruler of Scorpio. Pluto is the plumber of the zodiac, beckoning us beneath the surface, so that we might process any debris that might be sitting there, or, to be blunt, clear out the sewer. Not a particularly pleasant thing to do, but quite necessary every now and then to avoid even more, serious blockages in the future. Suffice to say, emotions that are coming up right now might not be comfortable at all, especially for those who have a lot of fire/ air in their charts, who prefer to keep things light and positive! Amongst myself and my closest friends, here are some examples of what is and has been arising over the past week. Issues around home/security/ finances/; illness to do with fluids (pneumonia); flooding of houses; old emotional issues coming to the surface; leaking roofs, a feeling of general down-ness or off-ness for no seeming reason; big emotions around parenting/ family issues and responsibilities; feeling sick to the stomach; feeling lost at sea, having lost sight of the shore; vivid disturbing dreams. So – what do we do? Well, those troublesome, irritating feelings or general dis-ease, “off-ness” or “not-so-goodness”, are just the tip of the iceberg. Underneath, if we do some deep sea diving, we may discover beauties like anger, sadness, grief, rage or fear, which are desperately trying to get our attention. And… as usual, we have the choice to feel them or to beat them into submission… guess which one works better? The good news is that if we are prepared to honour the feelings that come up, we have a very supportive, very powerful Grand Water Trine, formed by Sun/Moon, Jupiter and Neptune, which can help us to bring understanding to or clear some debris, so that we can move forward, lighter and less encumbered. Jupiter in Scorpio (more water) has just moved direct after 4 months of being retrograde. With Jupiter being a beneficial planet, this can be seen as a positive thing – much like a giant pressure hose, coming in to clear away all the sticky stuff, if we choose to allow it to do so. If however, we elect to repress or medicate or numb the emotions that are coming up, they will simply join the others lurking in the sewer, until the next time. If there was ever a time to ride the wave of emotion, this is it. Many of us are feeling the angst and suffering of Mother Earth and humanity right now, in addition to our own. Consider this… what if, each time we feel a feeling, without censorship or guilt, we help to transmute it, perhaps not only for ourselves, but for mankind and Mother Earth too? I see this as a time of radical self care. If you feel insecure, needy, inadequate, sad or full of rage, sit with it for a few moments and breathe into it… or express it in some way… dance it, sing it, paint it, write a poem about it, journal it – if it’s anger, hitting a pillow really helps. Then ask yourself how best you can show up, nourish and nurture yourself. Maybe that means cooking yourself a warm nourishing meal, sitting next to a fire, or perhaps connecting with the people who love you, taking a nap, or having a hot bath. What would you advise your best friend, lover or child to do if they were in distress? Every single time we abandon or berate ourselves, we deplete our energetic and emotional tanks. Every time we value and love ourselves, we fill them up. All our tanks need regular cleaning and refilling and this is the time to do it. The fuller our individual tanks are, the more love we have to give. Other tools that could help would be grounding – spending time outside with no shoes, walking, spending time in nature, meditating, deep breathing, or visiting a hypnotherapist, trusted energy worker or psychologist. Just as we feed ourselves nutritional food, and exercise our physical bodies, our emotional bodies and energetic bodies also need regular nourishment and tune ups! Eclipses always happen in sets and have much longer lasting effects than normal new and full moons. This one marks the start of the Cancer/ Capricorn eclipse season, which will last until 2020, so there’s lots of time to work with these themes . The last time we had an eclipse at the same degree was 11 July 2010, so you might find that there are similar themes that are coming up. This solar eclipse is also an excellent time to set new intentions. Wherever 20 degrees of Cancer/ Capricorn lies in your chart will usually be where this is most pressing. If you’d like to plumb further into this, you might consider setting up an Eclipse Reading, where we can explore how and where this is going to be working with you personally over the next few years. My next Art & Soul workshop, CELEBRATING WOMEN will be in Durban on Women’s Day, 9th August, followed by COME HOME TO YOU, a retreat on 10th to 12th August, where I will be collaborating with Deborah Prosser of Rest & Digest. Stay tuned for exciting new workshops and retreats in the Cape Area. We’re preparing for the partial Solar Eclipse on 15th February (New Moon in Aquarius), following the Lunar Eclipse on 31st January. The period between the two is often referred to as an eclipse gateway. Due to eclipses always representing points of growth, awakening and change – this can be a very powerful time, albeit not always entirely comfortable. At a partial Solar Eclipse, the Moon is positioned in between the Earth and the Sun, partially blocking out it’s light. We experience the effect of Eclipses for at least six months and as discussed in my last video, this pair link back to February and August 2017, as well as further back to 19/20 years ago (1998/1999). This does NOT mean that the same things are going to happen again, but if you look back, its very likely that you’ll find some common threads and themes, particularly if points are being triggered in your personal birth chart. It’s likely to particularly apparent if you have your Sun, Moon, Ascendant or other personal planets that fall in Aquarius or Leo. When we’re in between a Lunar and a Solar Eclipse, as we are now, it means that we are in a waning moon cycle, which is a time of letting go of the old, so as to make space for the new. During this eclipse gateway and on the day of the eclipse, it can seem as though everything that is buried deep down inside us is being pulled up to the surface. We might feel anywhere between a bit lethargic or lazy, to flat out depressed and confused. It’s often a time of endings and is always an excellent time to detox and clear out the clutter! These particular eclipse pairs are encouraging us to look at our lives from a higher perspective and potentially make some rather massive paradigm shifts. The Aquarius / Leo axis is concerned with how we give and receive love (including love for ourselves); whether we’re on course and are shining our light into the world the way we would like to; whether we are acting or reacting from our small selves (ego) or from our big selves and how our actions and reactions are contributing to the collective. Whenever there is a lot of energy in Aquarius, which there is at the moment, we tend to get shaken out of any ruts that we might be in. When the same old knee jerk reactions, hurts, fears and insecurities come up over and over again, it can often feel as if we’re just going around in never ending circles. Even though it seems that way, nature (and astrology 😊) continually show us that this just isn’t the case!. In my workshops this month, we’re working with the symbol of the Spiral, which appears EVERYwhere in nature, showing us that there is an incredible, awe-inspiring Divine order and symmetry, which we often can’t rationally comprehend. I find it more helpful to see our cycles as spirals, rather than endless circles. This way, whenever it seems that we’re experiencing the same old thing, we can consciously make the choice of seeing it and responding to it in a different way. Compare yourself now, to yourself 19 or 20 years ago. With a great deal of gentleness and compassion, notice your patterns, where you seem to say or do the same things over and over again, or where the same situations seem to be repeating themselves. As soon as you feel yourself in what feels like familiar similar situation, or find yourself about to react in the same way, about to utter the same words, take a moment. Breathe. Centre yourself. Get some distance. Breathe more. And then make the choice to consciously respond differently. If somebody is pushing your buttons – that taxi driver, that colleague, friend, family member – that person who always seems to say or do just the thing that makes you want to run and hide or scream or shut down or cry … ask what they are showing you, about you. Perhaps they could be enacting your shadow side – the part of you that you disown out of hand? You might not be able to change them, but they could be teaching you something valuable. Aquarius asks that we BE the change that we want to see in the world and big change starts with small change. For the next month, why not change it up. Instead of sitting in the same place, sit somewhere else, use a different tea mug, drive a different way to work, move your furniture around, introduce one new thing into your life and stick with it for 21 days. Find new thoughts and affirmations to replace old self-sabotaging ones. There’s a strong Neptunian flavour to this eclipse passage too, with Venus moving into Pisces on the 11th February and Neptune (the ruler of Pisces) squaring Mars. One one hand, this can bring confusion, slipperiness, lethargy, or delusion AND/OR it can be beautifully creative and romantic and can lead to deep insights and healing. HOW IS THE ECLIPSE SEASON PLAYING OUT IN YOUR CHART? Consider booking a reading with me to explore where and how this eclipse season is playing out in your chart and how you can best work with it’s energy. In July/August we will have the last two eclipses on this axis (for the next 19 years), so there’s still time to bring understanding and integration to what they are trying to show us. 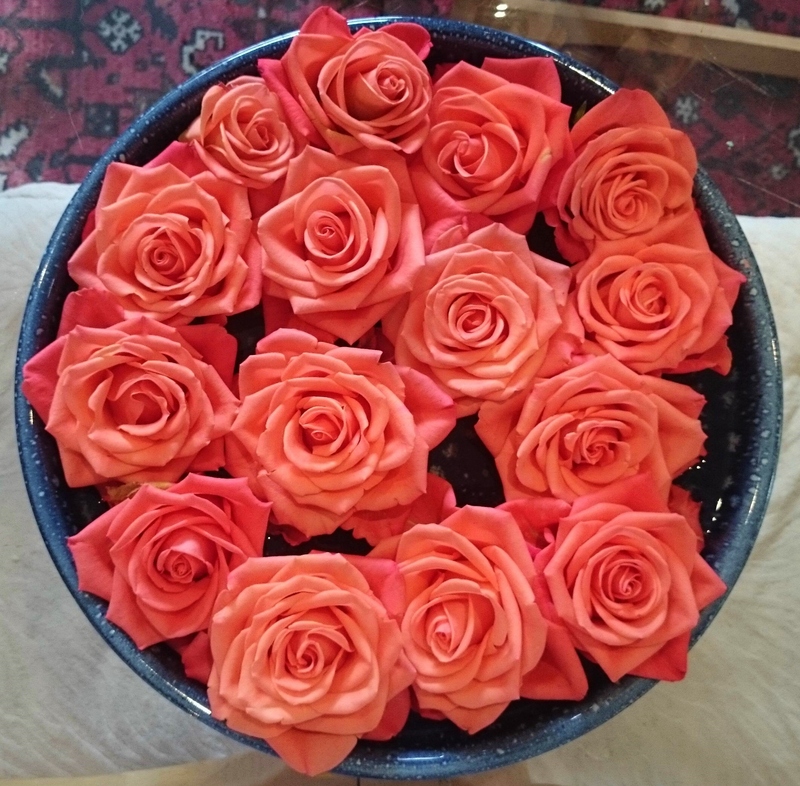 I still have some space on my SPIRAL OF LIFE workshop on Saturday 17th February, as well as two places on the EBB AND FLOW RETREAT in Grotto bay from 1st to 4th March. In my March Durban workshops – Wednesday Mornings and Saturday 17th March (new Moon) we will also be working with the Ebb and Flow theme as the Sun makes its way through Pisces. Please email me for more details. THE ECLIPSE SEASON HAS ARRIVED! We are now fully entering eclipse season, with a lunar eclipse or FULL moon on 7th August in Aquarius. This will be followed by a solar eclipse on the 21st August, which I’ll write more about next time. Let’s look at this one first. As we all know, full moon energy is always powerful, but eclipses are even more so, as they happen in sets and have longer lasting effects. This eclipse season relates back to August 1998, so reflect back on what was happening for you then. Chances are, there will be common themes at play!. The ruler of this eclipse is Uranus, bringer of thunderbolts and lightening, designed to get us to remove our heads from our butts… stop… look around and see the bigger picture. With Mars right next to the sun, we are provided with some extra vooma, to clean out any cobwebs and boot us out of any comfort zones we may have become ensconced in. The thing about comfort zones, is that they usually aren’t all that comfortable!! They’re just familiar and tend to keep us exactly where we are, doing the same things over and over again and expecting different results – the definition of insanity, according to Mr Einstein. SO, If you want something different in your life, what are you prepared to change? This moon full moon will shine her light on anything in our lives which makes us feel small, constricted or boxed in, bringing the rebel, the revolutionary, the quirky one out of the closet. She will also bring with her, brilliant out-the-box, intuitive ideas, for those of us who take some time to listen. It’s a stimulating moon, encouraging us to look deeper, shining a bright blue laser truth serum into those dark rutty corners and ferreting out all the lies we’ve been telling ourselves, for… oh… so long. Also paraded in the line-up will be the parts of ourselves and areas of our lives where we keep breaking promises to ourselves. You know… those things that we consistently moan about, tell ourselves we’re going to change…. And then do absolutely nothing about? Well, they are being ousted – exposed in the bare light of this full moon, with nowhere to hide. And there – right there, just as soon as they are exposed, we need to take ourselves gently by the hand and ask why – why when we know something isn’t good for us, do we do it? Or, when we know something is good for us, why don’t we do it? Saturn is forming positive flowing aspects to this full moon, helping us to see exactly how we sabotage ourselves and how often we are our own worst enemies. The truth is, if we really, truly believed we were valuable, wouldn’t we treat ourselves as such? It all starts there really! This full moon, ask yourself what ONE THING you can do to bring about change in your life. On the day of the eclipse, sit quietly and write a list of whatever you really, really, really want to let of for once and for all, the sabotaging patterns you want to send hurtling into the ethers, the habits that no longer serve you. And then put the date on the page and sign it. Go outside if you can and start to burn the paper. As you do so, make a statement something like this “I release this……. Now”. Once it has turned to ash, blow the ashes away into the light of the moon. Mercury will be turning retrograde on 13th August, so back all your data, check travel arrangements and contracts before you sign them. Take a few moments out of your busy day, pour yourself a cup of something lovely and really look at this image. How does it speak to you? Close your eyes and imagine yourself sitting somewhere outside on a bright sunny day, and observing the moon passing between the earth and the sun, blocking out most of his light… all except the bright corona or halo. How does it FEEL to you…. intuitively? Does it feel like a pause? ….Or maybe a curtain closing? ….Or a moment of darkness? Or the still point in a storm?….. Or the ending of something and the beginning of something else? Or maybe you feel it in a completely different way? On the 8th or 9th March (in South Africa) , we have a Total Solar Eclipse in the sign of Pisces, a very very powerful portal, where we are being called upon to PAUSE…. reconnect…. listen to our feelings and our intuition. If we take the time to do this, there is a possibility for huge release, healing and clarity, regarding our soul purpose. As we approach the end of our astrological year, this is probably the most potent opportunity we have to let go of what is no longer working in our lives and connect with a new way forward. This Solar Eclipse is very close to the South Node, which connects us with the our past, as well as to Chiron, which represents our old wounds, anxieties, blockages and inadequacies. This means that unconscious lunar emotions which arise right now, are clues as to what’s going on deep in our psyches, and what needs to be redefined in our lives. The way to harness the energy of this Solar eclipse is to connect with the innate wisdom that resides within us, by disconnecting from our logical brains for a while. This is often a challenge, because when we shut out the noise, we can feel as though we are momentarily plunged into the darkness or the chaos of our emotions, which is a tad unsettling for us human doings… but therein lies the magic as well. This weekend, I did a workshop where the instructions issued by the facilitator were a little vague. I felt my well-defined critical left brain wanting clarification, demanding a logical step-by-step process. But, when I realised that this wasn’t going to happen, I opted to surrender into the “not knowing” and let what needed to… arise. After a while, my left brain kind of went walkies and when that happened, the most amazing images and answers came through, unfiltered and uncensored by my inner critic…. And this happened for every single person on the workshop. For me, that’s what this Eclipse is all about. If you’re feeling a bit confused, weary, sad, overwhelmed or jaded, take a little bit of me-time. Pause… draw the curtains on the noise for a few moments and do whatever you do, to disconnect from your logical linear brain. Ask a question and then allow the answer to drift to the surface, rather than trying to force it. You might accomplish this by immersing yourself in water, or music, or art or nature – whatever it is that connects you with the deeper part of yourself… do that! Dreams, imagination and creativity are what open this portal to discovering healing and insights… not the logical mind. Actually, the more you try and demand answers from the left brain part of yourself, the more jaded, the more weary and the more confused, you might become. Let your soul be your pilot now. Sting’s lyrics really do say it all! The door is open over the next couple of days to understand yourself at a deeper level and release whatever it is that is limiting you. A clue as to what area of your life this would be related to, can be found in the house which contains 18 degrees of Pisces, if you have copy of your chart. ..into your life. Between each action or activity, take a few moments to just stop and breathe. When you get into your car to go somewhere, pause and breathe before you turn on the ignition. When you arrive at your destination, pause and breathe before you get out of the car (it only takes an extra couple of seconds!) . This is one of the most valuable processes I have in my tool-kit. When I remember to do it, it stops me from dragging the energy of one thing into the other and brings me into a quieter state of being. Try it… you’ll see! Let me know how it works for you. The solar eclipse is visible in Indonesia and the South Pacific, but felt by all of us. 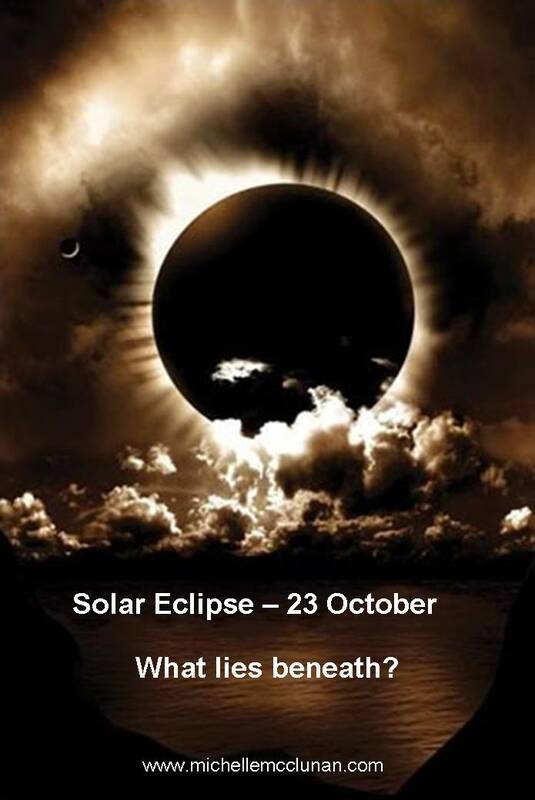 Just before Midnight on Thursday evening (23 October) at 11:55pm (South Africa), we have a partial solar eclipse, which although not visible in South Africa, is still being felt by us. A solar eclipse is seen as a more powerful time than a normal new moon and happens when the sun, moon and earth align and we see the moon moving across the sun, causing a shadow. This shadow or blanket effect has been felt by many of us already over the past few weeks, as many fears and issues from the past have reared their heads, along with extremes of emotion, potent dream experiences and a feeling of heaviness and confusion for many. Every new moon marks the end of one cycle and the beginning of another and is always an opportunity to plant seeds for the moon cycle ahead – the type of seeds depend on what sign the sun and the moon are in. This is a chance to look at what lies beneath, to take our attention deeper, reach inside and find the truth that resides in our unconscious. Scorpio is all about deep water, which relates to unconscious emotion. This means digging a little into our feelings of vulnerability, insecurity, sadness or fear and bringing into them into the light of consciousness. Only when we understand what our unconscious patterns are, can we start to release them. As long as they lie there unexamined and unnoticed, they continue to run the show from underground. Most of us really want to stay in the light and avoid any darkness, but this really does go contrary to the rhythms of the Universe. Everything is constantly in a state of death and regeneration. Your skin is shedding as you sit here and read this, cells are dying and new ones are growing. Everything is changing all the time and yet we resist it constantly. Imagine a world without night time. Imagine if we weren’t given the opportunity to recharge every evening, to connect with the potent imagery our souls present to us through our dreams. Somehow we’ve got the message that being in the dark, even briefly, is wrong, that if we’re not in the light all the time, there is something wrong with is. How come? There are seasons for everything. The wave builds, crests and breaks. All life is born, lives and dies. What if we accepted that those times where the light gets dimmed a little in our lives have something to teach us and are as important as the light, bright happy times. The truth is, we are never completely in the dark and we can always connect with the light that lies within us…always. Just like the eclipse pic, it looks dark, but the light is right there too. So with inner lantern in hand, this is the time to dig a bit deeper into those feelings. Allow them to be there for a bit and ask what they have to show you. If for example, on your explorations, you come up with a fear such as “I’m fearful of feeling my emotions more” ask yourself “If I were to feel them more what could happen?” The answer might be something like “I could lose control completely”. Then prompt… “ and if you lost control completely, then what would happen?” The answer might be “ I wouldn’t be able to function and run my life” and “If you weren’t able to function and run your life, then what? “I would be a failure” could be the answer – and there you have it -an unconscious fear of failure that is running your life from beneath. And there you have the unconscious core belief that you are not good enough. Funny this one, because the fear of opening our hearts is so common and it results in exactly what we are fearful of – shutting people out and landing up alone. This is the most potent time to feel what you feel, find out the beliefs that lie beneath, bring them into the light, question whether they are true, release them if they’re not and plant new ones that are. Garden gloves on, lantern in hand. The time has come all ye fellow humans to take off those rose coloured specs and replace them with a big old magnifying glass, a torch, some sturdy gumboots and a raincoat as we embark on a serious investigation… leaving no stone un-turned until we have unearthed the honest to God, pure, unbridled, unvarnished truth about ourselves and the role we are playing here on Planet Earth. There’s SO much going down right now that I’ve roped in good ol Professor Clouseau, the Pink Panther and Venus in Sagittarius, to help us move through it with a sense of adventure, lightness and humour. If you’re too young to know who they are, ask Mr Google – he’ll come to your aide. As we travel between the tunnel of two eclipses, most of us are experiencing some discomfort to put it mildly – Whether you’re feeling stuck, overwhelmed, weary of the same old thing happening over and over again, or just plain out of sorts, its ok… you’re not alone and it’s all meant to be… really! We are in the birth canal and are starting to feel labour pains before the birthing on the 3rd November, with the mother of all eclipses. Present in the delivery room will be the Sun and Moon, Saturn, Mercury Retrograde and the North Node – all in intense, investigative, deeply transformational, watery, emotional Scorpio ( I did say you needed gumboots and a raincoat). Add the exact Uranus Pluto square to the mix and we have some pretty potent revolutionary energy right there. As I see it, in plain English, this eclipse marks a potentially huge turning point, a breaking through of awareness, both personally and globally. It symbolises the death of old outworn patriarchal power structures, so that the new can be reborn into something more intelligent, evolved, balanced and connected. The seed that was planted in the sixties is now starting to germinate with the re-emergence of the feminine and the maturing of the masculine. I said “potentially” because in order to experience or be a part of any transformation, we have to show up and actively participate. What that means is that we need to take full ownership of being the change we want to see in the world and in order to do that, we first need to find out what needs changing, which is where Professor comes in. Herewith a handy Clouseau style guide into our very own personal thriller. Mount a serious no-holds-barred investigation into every aspect of your life. Of particular significance will be the areas where 11 degrees Scorpio and Taurus lie. That’s where you’ll find some potent clues and keys to open the doors of transformation. If you don’t know where that is or what I’m talking about, it might be time to have your chart done or updated. What am I feeling in my body at any given moment? Whose rules am I living by and are they serving me and anyone else? Have my belief system or my values changed and how? What or who pulls me back, makes me feel shackled, heavy or small? What or who makes me feel free, light and empowered? If I died tomorrow, what would I regret? What do I need help with and who can I ask? What can I do differently, today to help myself and our planet? How can I serve or nurture others? How can I lift my vibration? It is no mistake that you are here at this moment in time and it is never too late. My mom has reached the ripe old age of 90 and I can honestly say that as frail as she is physically, she has never been stronger emotionally, mentally and spiritually. Far from feeling unimportant she sees herself as performing an important role in sending light and spreading kindness to others. You too, are a unique and vital thread in the tapestry of life and everything you say and do does make a difference! Surveillance – keep watch of how other people (partners, bosses, friends, children and authority figures, drivers, call centre staff etc) trigger reactions in you. Notice them, and then turn the spotlight onto yourself and ask where in your life you do exactly the same thing. Even if you can’t see it at first, shine it around a bit and you’re sure to find something. Eg: “Bloggs is just so lazy, it’s driving me crazy” – Immediately… there and then, ask yourself where in your life you drive yourself crazy by being lazy. Or, “The Government / powers-that-be need to wake up and sort things out” – where do I need to wake up and sort things out? You get the drift…When you find something, see if you can chuckle at yourself, rather than beat yourself up. Be on the lookout for sensations in your body – these can be anything from feeling like a horse has kicked you in the solar plexus, to tears welling up in your eyes when something has touched you deeply, to delicious goose bumps when you know you’ve stumbled upon grace or unearthed a truth. Watch for synchronicities – even if they seem irrelevant. I’ll give you an example of a recent one of mine (shared only days later by one of my soul sisters) – I jumped into my car the other day and it was as dead as a dodo… nada… not even a glimmer of life. After contemplating my situation for a few minutes, I got out the car and roped some unsuspecting security guys into giving me a push and she started. I drove to the closest garage, where they told me that my battery was kaput and kindly lent me one until they could get a replacement. This little event held such lessons for me. First of all, my own internal battery has been feeling flat lately and secondly I realised I need to sometimes ask for help. I’ve also had a whole lot of un with blocked drains and flooded driveways in the past while, which have served to provide more clues as to what’s out of whack. Moments after I had the pipes cleared, my energy lifted… go figure! This is the time for us to connect with our innate wisdom (feminine) so that we can be guided how to actively and maturely participate (masculine) in transformation of ourselves and our planet. It’s so important that during this time of confusion and fear, we don’t freeze like deer in the headlights, but rather dive in and do what needs to be done to change what needs to be changed. Check out Russel Brand’s recent interview on. You might not agree with him or even like him and he might not know all the answers, but he’s being a catalyst and is prompting us to ask questions we might not normally ask, which is what Scorpio is all about. We’re being challenged to be revolutionary, to step beyond our comfort zones, take complete responsibility for our lives, for the impact we have on planet earth, for how we treat others, our thoughts, our reactions, the energy we project into the world… and to take it up a notch, to a new level of maturity. Basically we need to grow up, step beyond self doubt and fear and take action. Imagine if we lived our lives afraid of nothing, viewing every thing that happens in our world as an opportunity to change and grow… Imagine if, when in the soul state, you selected each and every person and situation in your life and elected to live during these times in order to help your soul evolve. With that viewpoint, there can be no blame and no victim-hood. The only thing is the question – how am I growing from this or what is it teaching me? “Transformation happens when you dare to be awakened to greater heights. When you stay open, no matter what. letting each experience, especially the tough ones, strengthen you and add depth and wisdom” Oprah. In the days leading up the eclipse, we have one of the best opportunities this year to see to our personal plumbing, by releasing whatever toxic waste or clutter we don’t need or doesn’t serve us– physically and metaphorically. Use Mercury Retrograde to reflect on any disempowering false core beliefs, fears, habitual behaviours, and resentments that are holding you back and start releasing them…. one by one. Writing them down and burning them would be a powerful ritual to perform just before the eclipse. And then on the 3rd, as the moon starts to wax, use your newly found awareness to set new, positive steps in motion. I still have a few places left on THE DIVINE ROMANCE workshop on the 2nd and 3rd, where we will be working with all of this. Continuing the theme of investigation into December, I will be running a “REFLECTIONS 2013” workshop, where we’ll review the road we’ve travelled in 2013, before we go hurtling into 2014. We’ll be creating a Gratitude Collage, which is a wonderful process. On the subject of Gratitude, if you haven’t already, please join my 26 DAYS OF GRATITUDE of Gratitude on Facebook. We’re having such fun and raising vibrations at the same time. This is one way that you can make a difference. Please share this with anybody you feel might benefit from reading it.